Karl F. Jackson, born 1935, in nearby Mohawk, played Junior Hockey in Calumet. He was an honors student at Calumet High School; when he graduated at age 16 in 1952, he received a scholarship to Michigan State. He was recruited to play hockey at Michigan State by Coach Amo Bessone, previous MTU hockey coach. 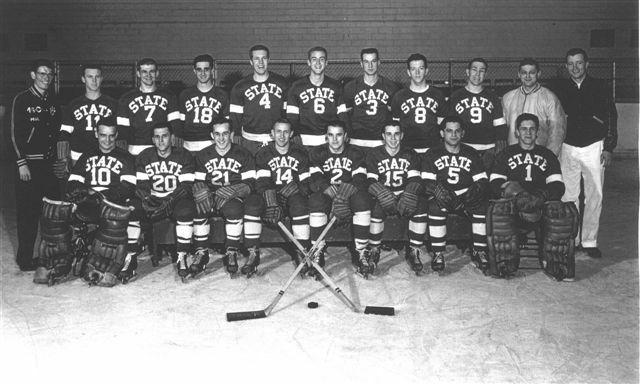 At 5'11", 160 pounds, Karl played for Michigan State for 4 seasons; the last 3 on the Varsity hockey team 1953-56. After receiving his BS in Mechanical Engineering from Michigan State and later an MBA in International Business from the University of Southern California, Jackson had a very successful 40-plus year career in Aerospace Engineering/Management. Photos courtesy of K. Jackson. Rob Roy -mgr-back far left. Sean Jacques born 19-- in -- played local junior hockey in Calumet and was the hockey team manager while in high school 1984-85. He has been a registered USA Hockey official since 1981. He has been a supervisor with the officiating program in Michigan since 1993, and since 1995, has been the Supervisor of Officials for the Upper Peninsula. Since 1996, he has been a member of the USA Hockey National Instructor Staff, having instructed at numerous District Officiating Seminars, Regional Camps a National Camp. He is a ref in the the local high school and college games in WCHA, CCHA, MCHA, NCHA. Since 2006, Sean has been the Michigan District Referee in Chief for USA. Jacques is a teacher and the Athletic Director for the Calumet school and assistant Fire Chief for the Laurium Fire Dept. 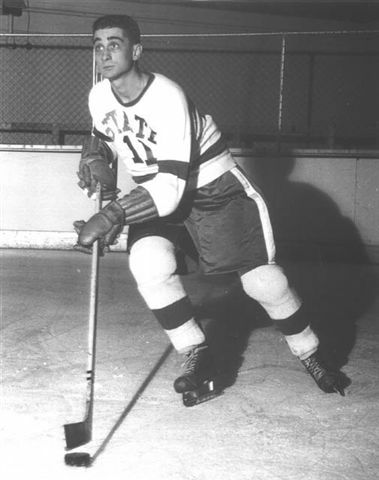 Gerry Jarvey, born 19-- in --, played junior hockey in Calumet and has been a ref in the WCHA. John Jarvey, born 19-- in --, played junior hockey in Calumet and has been a ref in the IHL. John Jewell, born 19-- in Calumet, played hockey for Sacred Heart School in Calumet, he then played for the University of Michigan in 1933-34-35 where he had a career of 28 wins 12 losses 4 ties and 7 shutouts; in 18 of these games he only allowed one goal! John played every minute of every game until late in his Senior year when he missed one game due to an operation. In a 1933-34 season highlight, he had 59 saves in a 2-1 win over Kitchener. His goals against average at Michigan was 1.84 John was Co-Captain of the team in 1934-35 along with fellow Calumet native and Red Wing great, John Sherf, when the Wolverines won the Big 10 Championship. Jewell was inducted into the U of M Dekers Blue Line Club Hall of Fame at the Yost Arena in 1975. John Jewell, goalie seated at left.